My dear hubby and I are both happy and fulfilled with our little family of three – plus pets – but our darling 8 year old daughter has wanted a sister for most of her life. Likewise, I’ve longed to host a cultural exchange student (formerly known as “foreign exchange students”) for as long as I can remember. We love to travel, and the idea of bringing the world to our door through an intercultural exchange – and sharing the community, city, state and country that we love and call home – was a natural choice for us. This year, we made many dreams come true by deciding as a family to host a wonderful 16 year old girl from Thailand in our US home. 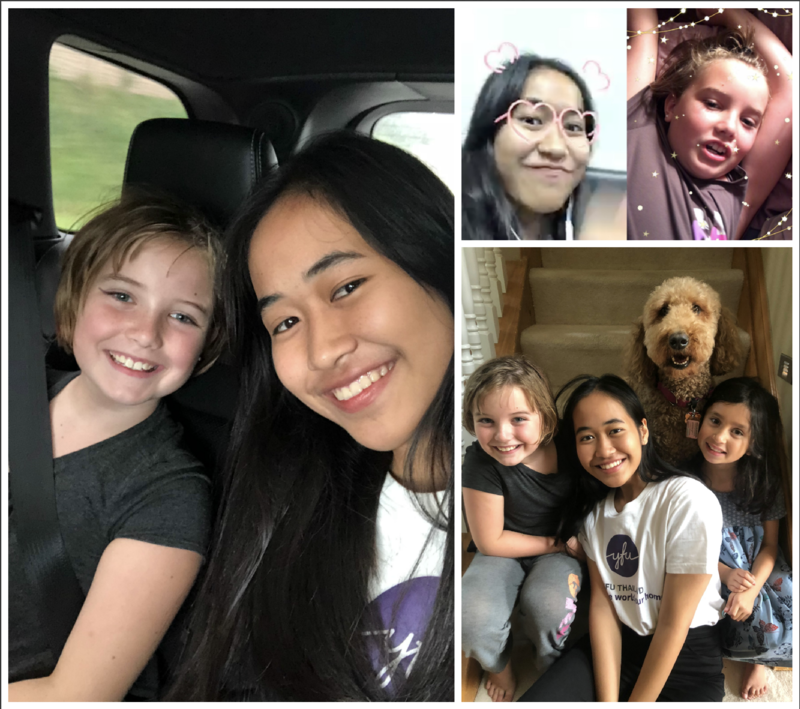 We are early in our journey of hosting through Youth For Understanding (YFU), but so far I can say it’s an amazing experience for our whole family and it has given my daughter the big sister she’s always dreamed of! Even better yet, our exchange daughter is also an only child (bless her parents’ hearts for giving her the opportunity to live 8,000 miles away for a year – no clue how they had the strength to let her go!) who has always wanted a little sister. So, not only is Napa living her dream of going to school in the US for a year – she also got a sweet American little sister in the deal. Hosting through YFU is an amazing experience that I highly recommend. When you open your heart and home to a courageous and motivated kiddo from another country, you gain so much in return. Napa and her fellow exchange students are simply terrific people and can teach us all a lesson in confidence, reaching for the stars and working hard to make dreams come true. They are true global citizens and inspire us to be the same! I also appreciate the opportunity to parent a high school student for a year, hopefully giving me a slight advantage when Zoe reaches that age and heads to the same school. When I first started looking into hosting a student, I searched online for sponsoring organizations and also crowdsourced among my friends and neighbors on Facebook. Several organizations were recommended – YFU, Academic Year in America and PAX (Program for Academic Exchange). We met with local reps from each organization and got approved to host through more than one, but then ultimately decided on YFU when my daughter fell in love with Napa while browsing through student profiles on the YFU website. It was love at first sight! I have to admit, it was fun for our whole family to look through the profiles. Our rep suggested several kids she thought would be a good fit for our family, and we looked through dozens more. Ultimately, we loved Napa’s profile – the way she wrote about herself, her humble yet enthusiastic nature, her smile, her family and her interests. She felt like she would be a great fit for us so in early February, we shared with YFU that Napa was our first choice and we’d like to host her. At that point, the processes and systems kicked in and we had to patiently wait! The biggest unknown at that point was our local high school and whether they would accept her. Our district is notoriously strict when it comes to hosting exchange students and sure enough, we had to jump through a few hoops. 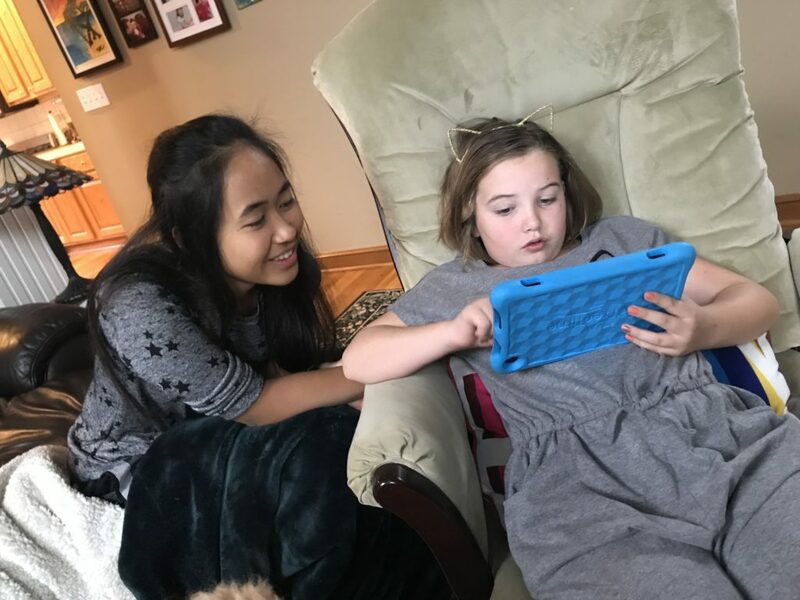 At last, toward the end of March, we found out that Olentangy had accepted her and then Napa was given our information and the school’s information. Then, at long last, we were finally able to begin communicating with Napa! We started with a few emails, then moved on to Instagram messaging and even tried Facebook video calls a few times. Zoe and Napa started to build a close bond through Instagram messages, photos and videos. They would show each other their rooms, pets, families and belongings. They began calling each other “sissy” and telling each other I love you almost right away! Both were so hungry for a sister, and they seemed to be the absolute perfect pair. We couldn’t believe how lucky we were to have found Napa! Both Eric and I enjoyed Instagram messaging with Napa as well, and it became a regular habit in our mornings (evening her time) or vice versa. In April, we sent Napa a package of goodies from Ohio. All spring and summer, we shared photos, videos and messages to continue building that bond, asking and answering questions and getting to know each other. In June, we took our last big family vacation as a trio. In July, things really started to feel real as we fixed up and decorated the room that would be hers for her year with us. 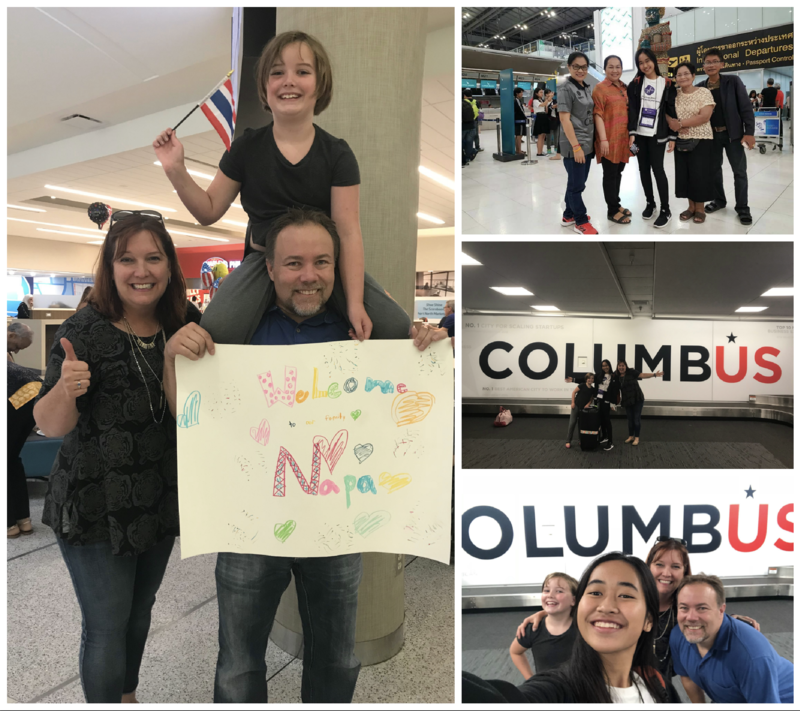 Napa took some time off from school around that time to travel and spend time with her parents – we simply could not imagine how they were going to part from their beloved daughter for a whole year. I remain completely in awe of their strength, sacrifice and immense faith in their daughter, our country and our family. August finally arrived, and we couldn’t wait to hug Napa and greet her with the traditional Thai “wai” greeting we had all been practicing! Our pages-long countdown that Zoe had been checking off each day for months was finally down to half a page of days. We messaged and talked with Napa daily, each of us more excited than the day before. She was really going to be here any day now – our very own Thai daughter/sister. Zoe made a fabulous poster to welcome Napa at the airport, and we bought an adorable little Thai flag from Amazon. E and I went to a five-hour pre-arrival orientation through YFU to prepare us for being good host parents. We learned the unofficial YFU host family motto, “Treat ’em like your own,” meaning that Napa really was for all intents and purposes going to be our daughter for the year. 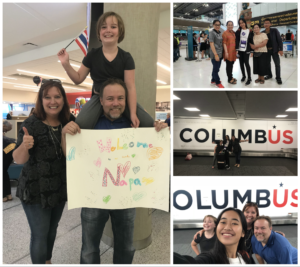 Suddenly it was August 9 – the day Napa left Bangkok to fly “home” to Columbus, Ohio! Her family’s joyful yet tearful photos on Facebook as they said goodbye really tore at my heartstrings. Their goodbye was our hello – we were so happy to welcome Napa, yet as a mom I could relate to her parents’ pain in letting her go! Napa traveled with two other Thai students coming to central Ohio with YFU. She messaged us from HongKong at their first stop – and then, after flying all night, she called us from Dallas to say hello and let us know she was in the USA! 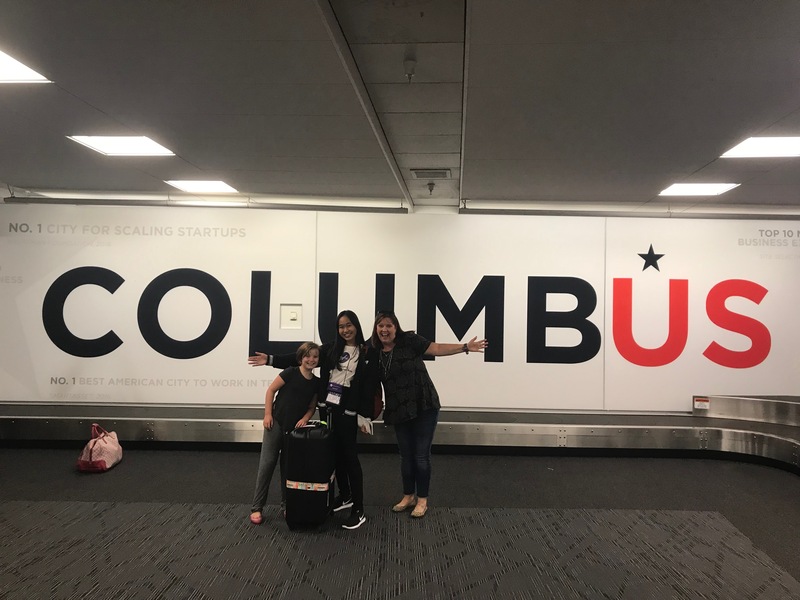 Napa’s flight into Columbus was due around midnight on the 10th, so we tried to settle Zoe down to sleep for a few hours and told her we’d wake her up in time to go to the airport and greet her sister. Then, the phone rang around 10:30 and it was Napa saying they had missed their flight. We were so bummed – but Napa stayed calm and positive. I told her I would get YFU’s help and to sit tight. I called YFU Travel and was so impressed with their support of these stranded students so far from home. Within 30 minutes, YFU had a rep at the Dallas airport to pick up Napa and her fellow tired travelers. The kids were taken to a hotel, fed pizza and given a chance to rest before their next day’s flight to Columbus! The YFU rep would have also re-booked their flights for them, but Napa had been able to take care of it herself at the airport. How many 16 year olds do you know who could re-book their own and friends’ flights at a strange airport in a second language after 24 hours of travel!? We were so proud of Napa, both that night and every day since. On Saturday, August 11, we woke up knowing we would soon be meeting our Thai daughter and sister for the first time. We headed to the airport with our Thai flag and Zoe’s welcome sign. The other host families at the airport brought balloons – something I wished I had thought of! We took one last family selfie as just us three, and waited eagerly for the Thai students to arrive. Suddenly, we spotted them! I took a video as they walked toward us – Napa was absolutely beaming. We shared wai’s and “sawadee ka” greetings, then enveloped her in big hugs! I didn’t think Zoe would ever let her sister go. I cried, just as I knew I would – and then saw Napa and Eric were teary-eyed, too. It was a wonderful, emotional first meeting that honestly felt like a reunion with a dear family member! The time since has been a joyful adventure. Things we take for granted day to day like simple communication, daily routines, everyday (for us) occurrences and family rituals are all brand new for us again as we rediscover them through Napa’s eyes. Likewise, we’re learning all about Thai culture, language and customs. 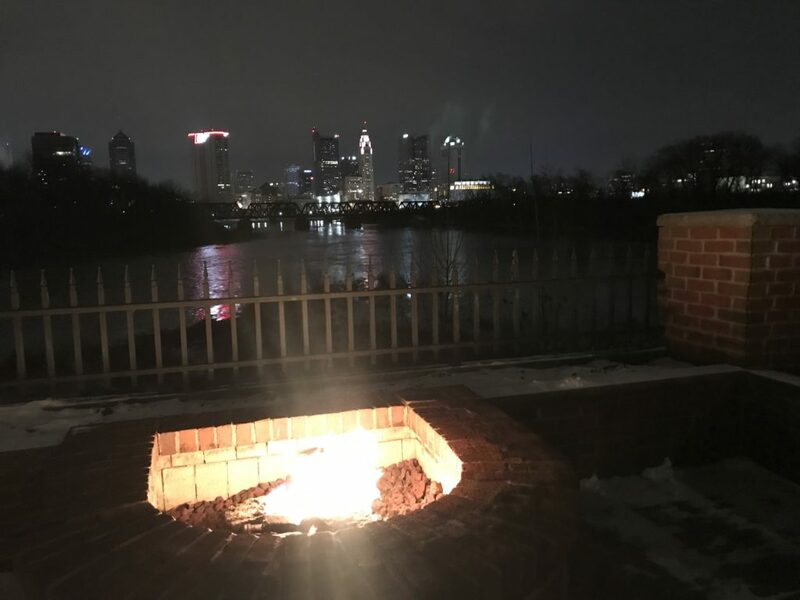 I’m sure I’ll blog more about our experience as the year progresses – but for now I will simply say that this is an experience like no other and we’re all so glad we embarked on this hosting journey! Have you ever hosted an exchange student? I’d love to hear all about it in the comments below or over on Facebook!